In the 1970s and 1980s, the Voyager probes visited the outer solar system, giving us some of the first close-up images of the giant planets at the edge of our solar system. Voyager 1 visited Jupiter and Saturrn before beginning a journey out of the solar system, while Voyager 2 continued along the plane of the planets and visited Uranus and Neptune. Not for the last time, Pluto was left out. To right this wrong (and to learn a lot about Pluto), NASA launched the New Horizons probe towards Pluto in 2006. After a nine year journey, it will reach Pluto in July, 2015. That sounds like a slow trip, but the distance to Pluto is huge: even light takes eight hours to get out there. New Horizons is actually moving away from the sun at more than 10 miles a second! New Horizons before launch, including humans for scale. The high speed of the probe is great for getting to Pluto, but terrible for staying at Pluto. To put a probe in orbit around a planet, we need to get the probe and the planet moving at almost exactly the same speed and in the same direction. And it gets worse: the smaller the planet, the smaller the gravitational field, so the closer you need to match the velocities. For the giant planets this is pretty easy: their gravitational pulls are so strong that just getting the probes there is a good start; once the spacecraft is near the planet will do a lot of the work. For smaller bodies near us (like Mars), we use a special orbit called a Homann transfer orbit to send the probes to the planets. The Homann orbit places the spacecraft in an elliptical orbit, using the Sun’s gravity to slow down the probe on its way out of the solar system. This technique is optimized for minimizing the amount of fuel needed to put a probe in orbit around another planet, but is very slow. Earth-Mars transfers take about nine months; an Earth-Pluto transfer would take about 200 years! Gravity transfers are out: we don’t want to wait 200 years to see Pluto. Our only other reasonable option is to fire New Horizons’ thrusters near Pluto to slow it down. This process would need a lot of fuel; we’re decelerating to zero from more than 10 miles per second, remember! Fuel isn’t light, and adding all this fuel would make the spacecraft significantly heavier. This is a problem: now that we’ve added weight, we need more fuel to even get New Horizons off the Earth. And this fuel takes up room, so we need to build bigger tanks. But this is more weight that we’ll have to decelerate, so we need more fuel on board to slow them down too. See the problem? For every pound you add in fuel for the thrusters, you really add way more than one pound of mission. New Horizons weighed about 1,000 pounds at launch; to use its thrusters to stop at Pluto, we would have needed to launch it with almost 70,000 pounds of fuel! We’re out of options. The only conclusion is that we can’t stop at Pluto. As a result, New Horizons is a flyby mission. It’s going to come within 6,000 miles of Pluto, but only once. It might seem like a waste to just go past Pluto once and end the mission; NASA agrees with you! Since launch, the plan has been for New Horizons to visit another Kuiper belt object after visiting Pluto. The problem is that we don’t know of many objects close enough to Pluto for New Horizons to visit. At launch, we didn’t know of any. In 2011, the team started a search for new objects near Pluto to visit. They collected images from telescopes in Hawaii and Chile, where they were sensitive to objects larger than about 50 kilometers (30 miles) in size. While they found 50 objects, none of them were close enough to Pluto to be appropriate for New Horizons! New Horizons’ post-Pluto plans were on the precipice of peril. We know how bright the object is, but have to rely on models of its composition and reflectivity to estimate its size. The best estimate is that 1110113Y is about 40 kilometers (25 miles) across. Based on 1110113Ys position and motion, New Horizons should speed along to it and visit in January, 2019. So why do we care? New Horizons’ goal is to study the outer solar system, and these observations will give us close-up information on a Kuiper belt object like never before. Kuiper belt objects are believed to be the building blocks of Pluto and the most similar objects to the original planetesimals that formed the planets. Therefore, studying Kuiper belt objects really enables us to probe the Earth’s formation, giving us an initial condition to use when modeling the effects of 4.5 billion years of orbiting the Sun. It always surprises me how low-res our images of Pluto are; it seems like we ought to have better images of something we once considered a planet (though as a practical matter I do understand why good images are actually hard to get). 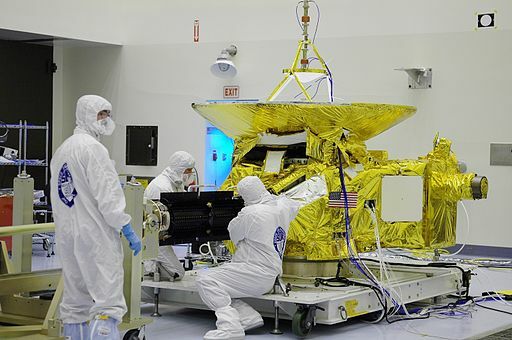 How far out is New Horizons going to be able to go and still remain in touch? Are we talking a Voyager-style super long term mission? It turns out that Pluto is both really small and really far away! We can resolve a few stars, but they’re benefitted by the fact that they’re self luminous too—for Pluto we have to observe it in reflected light, so the luminosity falls off even faster than 1/r^2.